FULL VEGGIE SHARE: Costs $30/week. There will always be a diversity of 8-10 items from the below list. Feeds 2-5 people, depending on how many veggies you consume a day. HALF VEGGIE SHARE: Costs $20/week. There will always be a diversity of 5 items from the below list. Feeds 1-2 people, depending on how many veggies you consume a day. In addition to the pre-harvested items below, all members who pick up from our “On Farm” location are welcome to utilize our "U-Pick". U-pick includes: Basil, Beans, Cherry Tomatoes, Cilantro, Dill, Ground Cherries, Mint, Parsley, Paste Tomatoes, Rosemary, Sage, Sugar Snap Peas, Snow Peas, Thyme, Tarragon and more! Please note, that due to unexpected weather, the availability of some veggies and/fruit may vary. Additionally, some items such as corn and potatoes are purchased from next door farms because they are not profitable for us to grow at our scale. 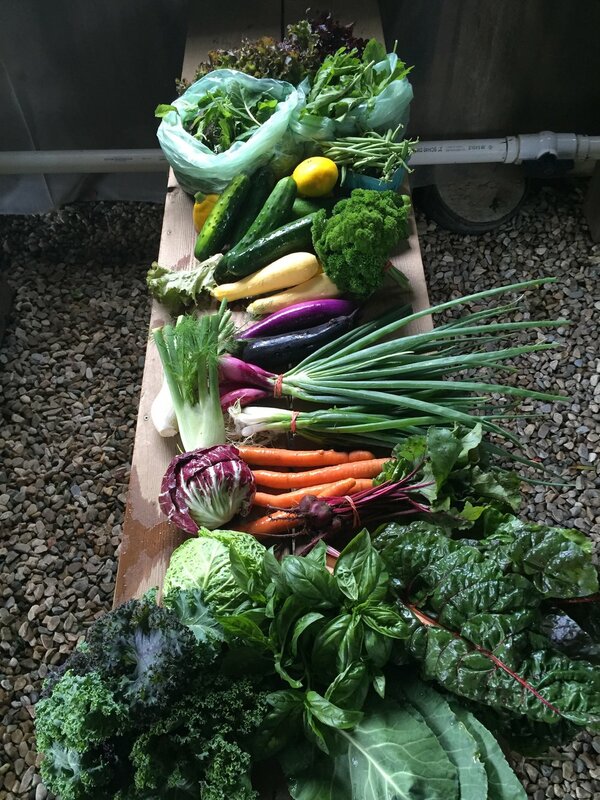 We do our best to source these items from certified organic farms within 20 miles of our farm. We will notify our members in the weekly newsletter that they receive. Here is an example of one of our shares in mid-June. Here is an example of one of our more abundant shares in July! Of what is featured on the table, on-farm members u-picked the beans, parsley and basil, the rest was pre-harvested. Members were also given the choice between chard, kale and collards as well as the choice between fresh red onions and scallions, and choice between carrots and beets. So the actual share people walked away with included 11 crops total. We like to give our members options when possible!